It’s time to look at the recent FLCL show. It’s been a while since I’ve seen such a terrible anime but leave it to this franchise to fix that. The first FLCL show is still considered by me to be one of the worst anime of all time. I’d have to say that it actually is in last place from the show’s that I’ve seen. This sequel is marginally better at best. It improves in the animation but certainly didn’t do anything to actually help the aimless writing and non existent plot. The show starts off with a small segment of the main character in an apocalyptic future where Zombies run amok. They start destroying everyone and naturally a dog is included as well. This kind of show just can’t resist such things. Get used to these scenes of nonsense since they will be in almost every episode. Hidomi then wakes up and goes through life as normal. She wears headphones so she can pretend not to hear anyone even though no music is playing. It works though as people don’t really mess with her. That’s when she gets a new transfer teacher who decides to change her life. It turns out that Hidomi is another time bomb whose emotions allow her to summon giant monsters and even gain super powers herself. Her greatest ability is the Kirby suction power which allows her to absorb anyone who gets in her way. It’s basically a one hit ko tactic against just about everyone. There is another person who wishes to stop the heroine though so everyone has to keep their guard up. This show is bad on so many levels so let’s start with some of the mild positives. Unlike the first show this one actually does have a few scenes where the animation looks pretty decent. It’s not that random experimental stuff we had to deal with in the older one. The animation is still pretty bad most of the time though. No effort is put into the character designs and nothing about this show tells you that this was made in 2018. It just doesn’t look nearly as good as it should and that’s because the show is trying (and failing) to be artistic. Enjoy the battle between Julia and Haruko as well as Hidomi vs Haruko since those fights are really the only times that the show gets to look good. The soundtrack also isn’t good. It’s mainly just satisfied to grab some tunes from the old show and call it a day. Don’t expect to get any solid battle tunes or anything like that. This just isn’t that kind of show I’m afraid which is rather unfortunate. It’s how it goes I suppose. Another tick against the show is the animal violence as I referenced earlier. Why did we need a dog to die in the zombie scenes? It really had no significance there and just served to help the show dig its own grave as always. The zombie scenes were also randomly violent despite the rest of the show not going that route. It’s all just for shock value. The show can also be rather fanservicey which is just what I’d expect. It’s not extreme like Fairy Tail or anything like that, but it all adds up. Throw in the fact that the main cast is terrible and we’ve got some problems. The main guy’s two friends are both terrible. One guy is so bad that he has to hire a girlfriend which is as bad as it sounds. The other guy never actually gets anything to do and is only around to mock everyone. The main guy (Ko) tries to help Hidomi at least but he does have ulterior motives so I don’t count that in the slightest. He also loses every fight he is in which really does not help. Then we have the main heroine Hidomi who is really hard to sympathize with. Her father left so she is waiting along with mother for him to come back. The issue is that he probably isn’t so the mother is hoping they can move on. Especially since she does all of the work while the main character shuts off life. She does help monetarily with her job at the cafe but certainly isn’t good for moral support. At least she finally initiated an attack on the teacher for the final episode but it took her way too long to finally try and be proactive. I would have liked to have seen her do something sooner and even in the final episode she ends up being extremely annoying and is unable to see the big picture so I can’t give her any props there either. There is also the teacher from the first series who has become a straight up villain in this one. Haruko wants to sacrifice the main heroine so that she can meet up with a mysterious guy from her past. Maybe in a classier show with decent writing her dilemma could have actually been a little sympathetic. Maybe we could have seen her trying to find a different way to do this or something like that. Instead Haruko comes across as very unreasonable and likes to go about her plans in a very roundabout way. Most of her actions don’t even make sense so you just wonder how important her goal ever was to her. Julia is Haruko’s rival and is always trying to get in her way. Julia will talk tough to Haruko about how this isn’t right, but spends far too long trying to convince her arch nemesis of this. After a while she should know that Haruko isn’t going to change and yet she doesn’t do anything about this. You can’t feel bad for Julia when she is inevitably beat up because that character never even had a good plan. I feel like none of the characters in this show are even remotely intelligent. Then we have a bunch of random side characters like the plant owners. Their plot is just pointless and tries to add some mystery to the whole thing, but it fails quite badly. You’ll just be wondering why the show thinks you will end up caring about them when that is certainly not the case. If anything it’s the opposite and you’ll just be counting the minutes until the episode ends. Overall, This show just couldn’t do anything right. The humor falls flat and the characters aren’t interesting in the slightest. The writing is horrendous. The battle scenes can be good but considering who is fighting it hardly matters. The show is just soulless and doesn’t do a good job of trying to prove that we can have a quality show in such a short amount of time. Anime should at least be 12 episodes if you ask me although in this specific situation I doubt it would have helped at all. I’d advise staying away from this anime. Keep your distance and you’ll be fine. 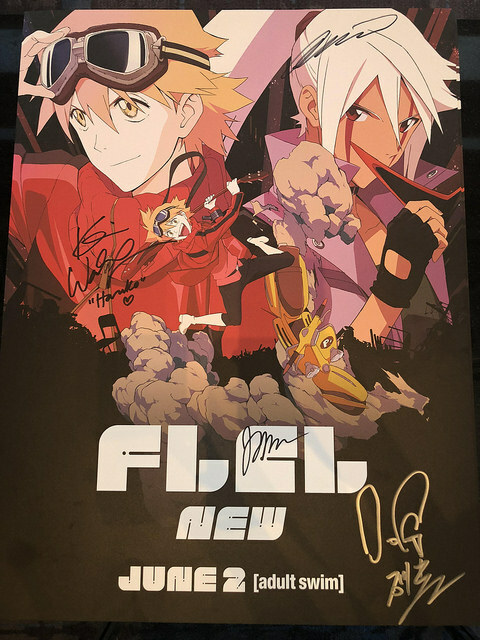 This entry was posted in 1 Star TV Shows, Reviews, TV Show Reviews, TV Shows and tagged Anime, Anime Review, Drama, Experimental, FLCL, FLCL Progressive, Progressive, Review, Sequel, Slice of Life by dreager1. Bookmark the permalink.